The Fall 2011 Issue of The IDEAL Magazine has arrived! Click "Expand" to enlarge and read the magazine. With Gabrielle Dennis from BET's The Game on the Cover and inside features on comedian Rodney Perry and singer B.Blunt the fall issue is a smooth read. Fall Wedding tips are given to the bride, and be sure to check out the IDEAL HOT list with some of the hottest and sexiest men in entertainment! Justin Mabrie, MBA gives his relationship advise and motivational speaker Paige Robinson shares her tips for staying optimistic. Of course there are the fall product must have's and special event coverage of the Black Enterprise Golf and Tennis Challenge. A special story on the Dr. Martin Luther King, Jr. national memorial dedication initiated by Alpha Phi Alpha Fraternity and a special letter/article from the editor on the 10 year anniversary of 9/11. HAWTTT Neeta. Loved Loved Loved the Hot list. Yummy! Great job Neeta, glad that I could be apart of the issue..
Neeta! OMG, this is awesome!! Congrats. I am gonna read every article and push it for you on twitter. All my 33,000 followers on all 3 pages! Great start to a great magazine. Love the MLK write up! Wish I could have experienced that. Looking forward to what comes next. Great content. I am really excited in the direction IDEAL PR MEDIA is heading! LOVED THE MLK piece! Today is Rodney Perry's birthday. How cute that it came out on the same day...I wonder if that was planned? Thank you Ideal Magazine for giving me this opportunity to express some of the Soulful Seeds that were passed down to me. I sincerely hope your readers enjoy it and I look forward to being a part of such an amazing magazine! Wow!!! The magazine is really well put together. I am happy to be part of the such a wonderful creation. Love it! 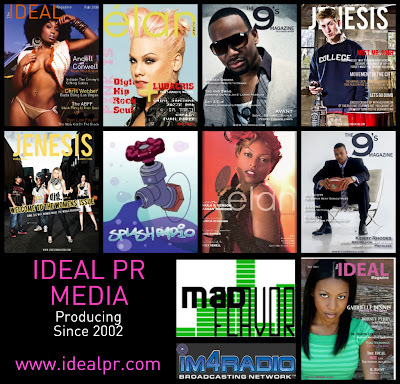 Get it Ideal PR Media! Neeta you are doing your thing in this issue. Loved your 9/11 piece. Hey Neeta, Love the articles and you used a couple of my pics. Your back in business. You can count on me spreading the word.